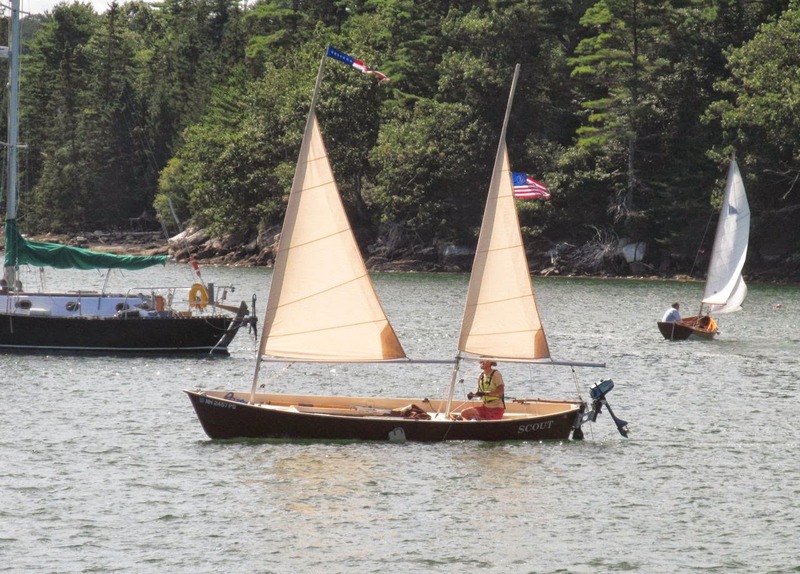 Goat Island Skiff Amateur Style and the Sea Pearl 21 Too: FrankenBoom! I built my boom originally as a temporary boom to get me on the water ASAP. How does that old saying go? "There is nothing so permanent as a temporary fix" or something like that. Anyway, that temporary boom has been quite permanent on my Goat Island Skiff for the next two sailing seasons. It has always been a little wobbly, especially since I use my sail loose-footed. The tension along the foot slightly distorts the boom and I do lose some power. I decided this winter to finally fix this boom. Originally I was going to build a fancy shmancy box boom like many of my Goat Island Skiff compatriots. I went over to Goose Bay Lumber and purchased a bunch of cedar for $63 and cut it into a bunch of strips only to realize it would be way wobbly. So then I got some Doug Fir for $15 and cut it up and put together another box boom, but I still wasn't happy with it. So screw it! I decided to take my old boom and slap on one of those DF strips to the top of my boom, to compliment the lower horizontal piece. I am proud of my laziness. BEHOLD FRANKENBOOM! So, this boom is definitely stiffer than the old temporary boom. It is also heavier, but not by much. I am happy with the results and will test it out this year on my Adventures-- of which there will be more than last year because there is a modicum amount of income flowing into my coffers. That being said I have some very nice strips of western red cedar, no knots, 12' long, for sale. On a side, the inrepid reader may also be interested in following my slow-poke restoration of my Beverly Dinghy.